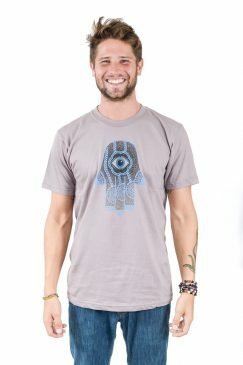 Think Positive Apparelâs Hamsa design is made entirely from affirmations and quotations relevant to the symbolism of the downward facing hamsa: receiving protection and good luck. 50% polyester/25% combed ring-spun cotton/25% rayon, 32 singles, 4.3 ounce tri-blend tank. Extremely soft, comfortable and stretchy. Fabric laundered for reduced shrinkage.